I almost didn’t post this recipe. I mean… let’s look at the photos. Ahem. Not my best work (breadsticks are REALLY REALLY not easy to photograph, you guys. Just saying). But can you believe that there is only one other recipe for breadsticks on this blog, you know, the blog about bread? And believe it or not, the photos of those breadsticks are even worse (I’ll let you forage for that evidence if you dare). But what we lack here in breadstick glamour shots is made up for in a recipe for garlic butter breadsticks that will blow. your. mind. And your tastebuds. That, at least, I can deliver. The recipe for these breadsticks actually comes at the request of a reader (hi, Nancy!) but it’s also been on that “Must Bake” list I allude to every now and then, which truthfully only exists partially in my head, in chicken scratch on random dates in my planner and practically in Morse code in my phone’s notes. I scroll through the list and read things like, “CP wed soup”, “ice cream from MEC”, “pump bagels”, all of which will hopefully make their way to the blog this year and thus be fully decoded. But for these breadsticks, the note was “MAKE BREADSTICKS ALREADY,” so the calling was clear. Nancy really just was the final push for me to get my bum in the kitchen and make those breadsticks already. So thanks, Nancy. I didn’t really say much about this in my last post of 2015 and that’s because I didn’t feel like ending the year with such, well, negativity, but I am in a rut. Again. Yes. Is this the way of the creatives? That we trod and trod and trod our way through our work only to be burned out again and again and again? Or am I just extra-sensitive to this? What I am trying to say is: 2015 for me and this blog was a tumult of emotions. I’m not proud of how often I let comparison rob me of the joy that I otherwise have when I blog, but it got to me, and it got to me a lot. I felt emptied, excluded, defeated, frustrated and worn out. And what’s so ironic about that is that I ended the year with the highest number of visitors I’ve ever had come to the blog. I should only be elated. And let me be clear — I AM. I am so elated. Don’t let this come across like I am not insanely grateful for each and every reader who comes to this humble little space of mine to see my recipes and comment on them and actually make them. How I am like a proud mama when I see your posts on Instagram of that no-knead Dutch oven bread you finally tackled or those banana cream cookie pies that you topped with your own twist. I love it. It’s why I do this. It’s why I trod and trod and trod, even when I just really don’t want to anymore and I’m ready to fold it all in and call it a day (or six years) and walk away. To be perfectly honest, I often feel like the source of my burnout is that I’m not sharing what I really want to share here. That I’m not telling you more about what’s going on in my life, behind the bread, beyond the oven. That I’m not posting recipes that I actually want to post, but more recipes that I think you want to see. This recipe is one of those that covers both categories — because I really do love these breadsticks and I thought you would, too. And that happens here often, I promise. But I’m thinking that, from here on out, I need to be even more authentic. That I need to put a little more “real life” me on here. Or maybe not. Basically, I just want to follow my heart and where it leads me in this blog space in 2016, cheesy as that sounds. 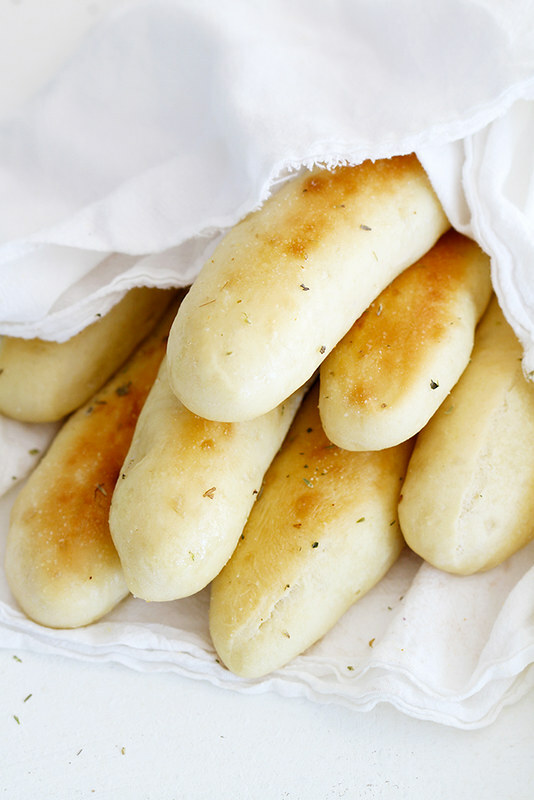 And right now, my heart wants these soft, warm, garlicky, buttery breadsticks. Or is that my belly? Hard to tell sometimes. In large bowl or bowl of stand mixer, whisk sugar and yeast into warm water to dissolve. Let mixture sit 10 minutes until yeast is foamy. Add 3 1/2 cups flour, salt and melted butter. Stir until dough forms. On lightly floured surface, knead dough by hand 10 minutes, adding just enough remaining flour until smooth, soft and only slightly sticky dough forms; OR, using dough hook of stand mixer, knead dough on medium speed 5 minutes, adding just enough remaining flour until smooth, soft and only slightly sticky dough forms (it should pull away from sides of bowl). Place dough in clean, lightly oiled bowl, turning dough once to coat. Cover bowl with towel or plastic wrap and let dough rise 1 hour until doubled. Heat oven to 400 degrees F. Line 2 baking sheets with parchment paper or nonstick baking mats. Punch down risen dough. Roll dough into 2-foot-long log, then cut dough into 16 equal-sized pieces (about 1 1/2 inches long). Roll each piece into 7 to 8-inch long breadstick shape. Transfer to prepared baking sheets spaced 2 inches apart (about 8 breadsticks per sheet). Cover breadsticks with towel and let rise 30 minutes. Brush breadsticks with 1 tablespoon melted butter and sprinkle with 1/4 teaspoon salt. Bake 15 minutes, rotating baking sheets as needed, until breadsticks are lightly browned and baked through. * Once baked, brush with remaining 2 tablespoons butter, then sprinkle with remaining 1/4 teaspoon salt, garlic powder and oregano. *NOTE: If desired, place fully baked breadsticks under the broiler for a few minutes to give them an even deeper golden brown color. Oh these look fantastic! And the photos look pretty good to me! And I hear you on the comparing yourself to others..it’s so hard not to especially in the blogging world..but just remember when you are envying someone someone else is probably envying your work! like me 🙂 keep up the great work! love your blog! haha, the recipe title speaks for itself! No convincing here! I think these breadsticks sound (and LOOK) lovely! These breadsticks look amazing!! I think your photos are pretty darn good! You should see the photo of my breadsticks… Yours blow mine away. Well done!! First, this recipe is killer. I can’t wait to make it and spice up lasagna night! Second, I hear ya on the burnout. I think part of it is that we are creatives. We are prone to cycles. But also, I blame someone at a blog conference (I can’t remember who it was, but it was 1.5 years ago), that told me I should be posting the recipes my readers want to see. So I did that. And thus began my 1.5 year unhappiness stint with blogging. A blog used to be my creative outlet. And now it’s my business? No way. I’d rather go back to work and keep blogging on the side for ME. Anyway, I’m here for you. I should have texting you all of this instead of writing it here in PUBLIC. We want to see your real life!!! I feel like we all go through blogging ruts at least a little bit – I’ve been feeling creatively stuck recently and only brainstorming when I’ve needed to instead of being struck randomly by inspiration, but it all ebbs and flows over time, right?! I love breadsticks! I’ve never made them at home before because I know I will eat all of them! Be still my heart! These breadsticks are everything! And as for the “rut” – yes, that is the way of most creatives, I think! Just keep going, dear… you are getting there :). I love bread and thank you for giving us a recipe to make in our homes. Thanks for sharing! Thanks for ALL YOU DO for us on a daily basis! You are wonderful and so creative! Don’t worry about being authentic, it is wonderful to share all your ups & downs with us! We are human, not robots! Thank goodness! I just adore your recipes! 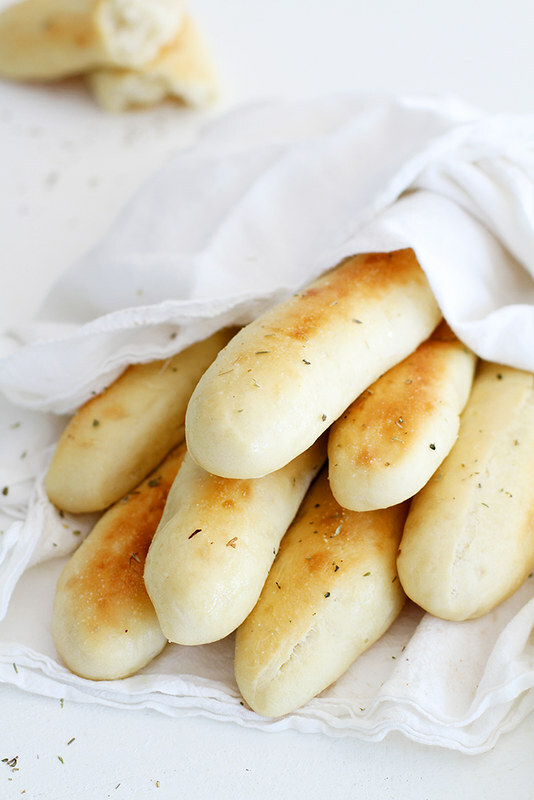 This garlic butter breadstick recipe is so inspirational for me! I am still flying the banner or making bread, I seem to do something bad to the yeast in making the water too hot, thus hockey pucks for rolls! But this year, 2016, I pledge to master this too! The breadsticks are calling out for soup! So, into the kitchen, I go! I am a wonderful biscuit maker, so move over Hardees! Praying for this year, 2016 be the best ever for you! These look absolutely amazing! Must try. These look so good! I can’t turn down a good breadstick, especially homemade. Lauren — Thanks, dear! That “working ahead” tip is really helpful! Rachel — Thank you, dear! I so appreciate that. PennyW — Just keep swimming… ha, I love it! 🙂 Thank you so much! Nicole — So true. Thanks, friend! Hope you are well! Fresh garlic rolls, I love it. Saw on IG and almost drooled on my phone. Love! These look incredible! Carbs 4 Ever! I feel you on the feels. I think when we met up I was REALLY in the thick of some serious blogger emotions and probably talked about it way too much. I’m still struggling with insecurity and feelings, but I also thinks it’s part of the territory–a not-good-enough feeling that maybe drives us? IDK, maybe I’m making that up to make myself feel better. But, I get what you’re saying…solidarity!! This recipe sounded yummy and so easy, I had to make them. Awesome!!! My family loved them. Thanks for sharing this recipe. They will become a ‘go to’ recipe!! I am so excited that you Shared your Bread Stick Recipe (& gave me a shout out)…Thank You for Both! I can’t wait to make these, which I will be, next Sunday (1/17/16), to go w/ my Homemade Pea Soup…can’t wait! I’ll let you know how they come out, as I’m still an Amateur at making Breads, Bread Sticks, etc., keep your fingers crossed! Tho, I have no fear really, bc your Directions are easy to follow & Recipe(s) are Awesome! Soon I will be trying your other Recipes w/ my GrandDaughter! Thank You again! I love you, girly! The battle between letting our creativity flow in full-force without worrying about how our readers will perceive our work versus being ultra conscientious about how each and every post is accepted(/rejected) by our readers + the blogging community is by far the most difficult part about blogging. There’s definitely a lot of outside noise that seeps into our work that can kill the passion for the art. I’ve always loved what you do here and hope 2016 feels far more fulfilling. I’m giving you a ginormous bear hug! This is such a great post. I think we can all relate to feeling burned out. I find that when I step away and live a bit without having to worry about work, I come back refreshed and ready to write and create. 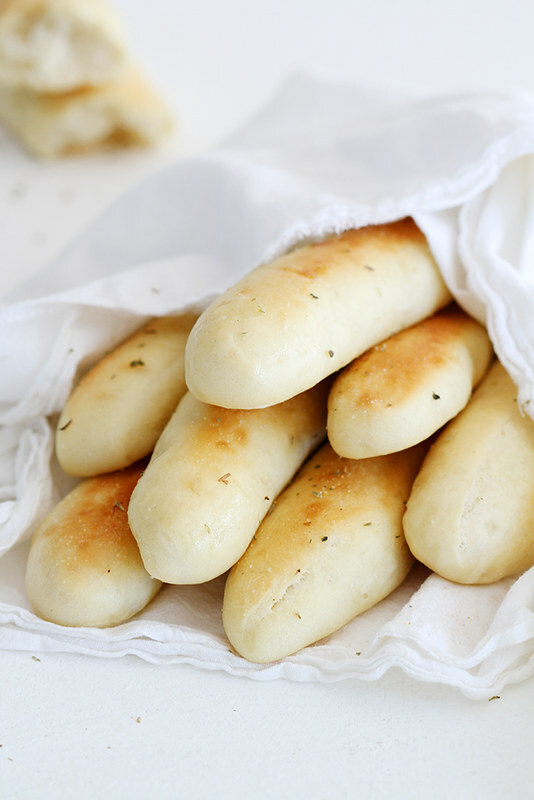 These breadsticks look amazing! This recipe looks awesome! cant wait to try it! One question though… the total time of the recipe says 50 minutes, but you say to let the dough rise for 1 hour. So is it a total of 1 hr and 50 minutes? Or should I be using rapid rise yeast and let it sit for less time?